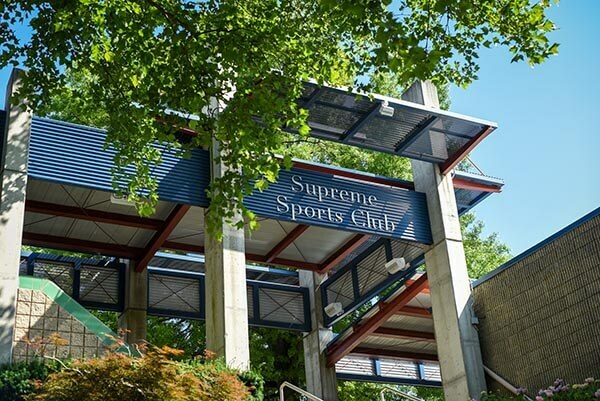 Notice: Upcoming renovations scheduled at Supreme Sports Club. Click here for details. Supreme Sports Club is where family and friends gather for the best destination in health, wellness and recreation. This facility is open 24/7 so that you can work out and socialize at your convenience. Members can enjoy an eight-lane lap and recreational pool; a children’s wading pool with an interactive play feature; a 12,000-square-foot arena for basketball and volleyball; racquetball courts; a 1/10 mile indoor track; 2,400 square feet of weight workout space; strength training equipment, including Cybex, Life Fitness and FreeMotion weight equipment; 5,000 square feet of cardio workout space with state-of-the-art cardio equipment, including personal flat screen TVs, treadmills, Internet access, elliptical trainers and other cardio equipment; group fitness classes; KidSpace for children 6 weeks to 13 years old (KidSpace option required); roller and inline skating; a co-ed whirlpool; saunas; a family changing room; and locker rooms. The facility is also available to host birthday parties, meetings and special events. There’s also a Women’s Gym (more info below) and specialty classes such as studio cycling, yoga, CxWorx and Body Pump. This is a place women can call their own. The Women’s Gym provides a private workout and free weight areas, specialized cardiovascular and weight equipment and group fitness classes. Roller and inline skating are available at Supreme Sports Club. You can hang out, have fun and meet friends on weekends with skating, a snack bar, music, and more. Skate parties and rentals are also available. The perfect mix of cardio and strength, TRFlex is CA’s new functional training program – designed to give you the complete fitness program you need. Centered around our suspension trainers, TRFlex delivers the best elements of high-intensity (H.I.I.T.) and resistance training through its three main classes: TRX Strong, TRX Sweat and Total TRX along with our foundational classes TRX Basics and TRX Gold. Each class is 50 minutes. Don’t see a class time below that works for you? Groups of four or more may request an additional class be added to our schedule. Just click here to submit a form and one of our TRX Coaches will contact you soon! TRX Basics: TRX Basics is an instructional class aimed at establishing the fundamentals of TRX Suspension Training. The workout focuses on the entire body through an emphasis on strength, mobility and endurance. TRX Gold: Our continuous fitness program designed for the actively aging. This class delivers targeted full-body workouts to improve your balance, flexibility and mobility as you battle the effects of time. Utilizing the TRX Suspension Trainer, TRX Gold provides a great low-impact workout while improving your quality of life. TRX Sweat: Are you looking for that H.I.I.T full-body workout to add to your fitness routine? Try TRX Sweat! This cardio-based H.I.I.T program is guaranteed to push you to your limits and make you sweat! This class is great for enthusiasts of all fitness and experience levels. Total TRX: CA’s most complete suspension class! This full-body workout is guaranteed to deliver a fun, high-energy experience, blending the strength of TRX Strong and the endurance of TRX Sweat.